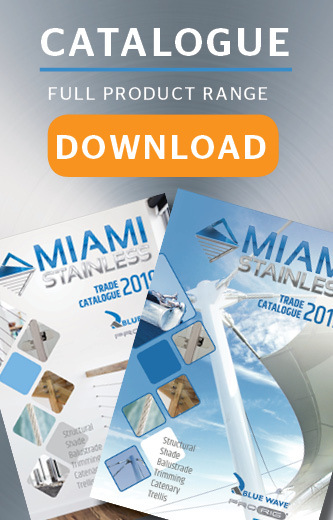 Miami Stainless ProRail Fixed Corner Saddles are high quality AISI 316 marine grade stainless steel perfectly suited to corner handrail sections. Miami Stainless ProRail Fixed Corner Saddles are designed to suit 3.0mm corner and end posts, suit Australian standard size tube, available in satin finish and mirror polish and suit flat and round handrail. Saddle Corner Fixed suits 2" (50mm) x 1.6mm Tube Round Handrail Mirror Polish ProRail AISI 316Miami ..
Saddle Corner Fixed suits 2" (50mm) x 1.6mm Tube Flat Handrail Mirror Polish ProRail AISI 316 Mi..
Saddle Corner Fixed suits 2" (50mm) x 1.6mm Tube Flat Handrail Satin Finish ProRail AISI 316 Mia..
Saddle Corner Fixed suits 2" (50mm) x 1.6mm Tube Round Handrail Satin Finish ProRail AISI 316 Mi..
Saddle Corner Fixed suits 2" (50mm) x 3.0mm Tube Flat Handrail Mirror Polish ProRail AISI 316 Mi..
Saddle Corner Fixed suits 2" (50mm) x 3.0mm Tube Flat Handrail Satin Finish ProRail AISI 316 Mia..
Saddle Corner Fixed suits 2" (50mm) x 3.0mm Tube Round Handrail Mirror Polish ProRail AISI 316 M..
Saddle Corner Fixed suits 2" (50mm) x 3.0mm Tube Round Handrail Satin Finish ProRail AISI 316 Mi..